On the same page in American 1812 era history…. Mr. Ryan Dutiel, received a history lesson about the War of 1812 on Friday, February 3rd. 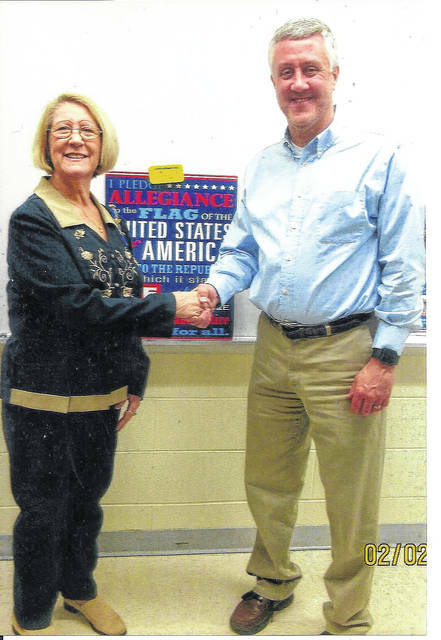 timing was “on the same page” with his History class plan; approval was received by the school’s Principal Mr. Donald Stapleton. Mrs. Stewart provided a basic outline of the “Second American Revolution,” as the War of 1812 is sometimes called. Students learned of President James Madison’s reasons for supporting this pivotal war for independence from Great Britain. Stewart told them of a young widow, Mary Pickersgill, having been commissioned by U.S. Major George Armistead in 1813 to make two flags for the military; a storm flag for inclement weather, and a flag measuring 30 ft. wide and 42 ft. long to fly over Ft. McHenry. The students learned that in 1814 the Battle of Ft. McHenry began, and Mrs. Stewart shared the important inspiration of Francis Scott Key, who wrote a poem, “The Defence of Ft. McHenry,” that was later renamed and became The National Anthem of the United States of America. provided the students with patriotic pencils and War of 1812 informational worksheets. Available to speak on this historical topic to area schools, Stewart may be contacted through the Scioto Valley Volunteers Chapter at www.svv1812@outlook.com.